I love this recipe, and I always think that I have already posted this recipe, but no! This is one of my favorite go-to recipes when I haven’t gotten to the grocery store or at the end of the month when funds are low. It’s such a delicious recipe–the eggs become creamy, and the sauce is mildly garlicky, but not enough to turn off my kids. My kids fight over the bacon, so I usually double the amount that the recipe calls for. This really is a great, quick dinner. It comes from the The Best of America’s Test Kitchen 2007 Annual. 1. Bring about 4 quarts of generously salted water to a boil. 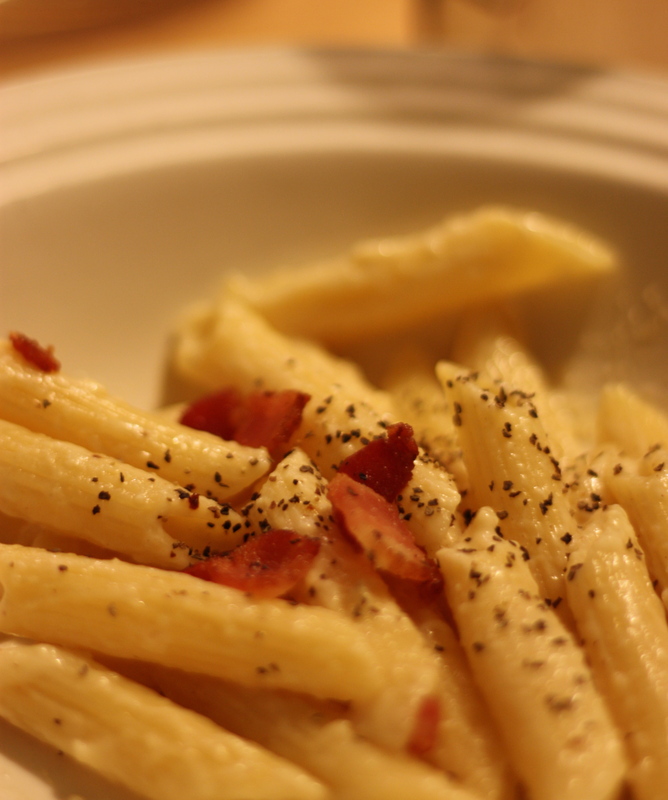 Whisk the eggs, Pecorino Romano, and cream together in a medium bowl; set aside. 2. Meanwhile, cook the bacon in a large skillet over medium heat until crisp, about 8 minutes. Transfer to a small bowl with a slotted spoon. Pour off all but 2 T. of the bacon fat. Add the garlic and pepper to the skillet and cook over medium heat until fragrant, about 30 seconds. Slowly whisk the garlic mixture in to the egg mixture. 3. Add the wine to the skillet and simmer over medium heat, scraping the bottom of the pan to remove browned bits, until reduced by half, about 5 minutes. Slowly whisk the wine mixture into the egg mixture. 4. Meanwhile, add the salt and the pasta to the boiling water. Cook, stirring often, until the pasta is al dente. Reserve 1 cup of the pasta water, then drain the pasta and return it to the pot. Immediately pour the egg mixture over the pasta and toss to combine with 1/2 c. of the reserved cooking water. Add the bacon and thin the sauce with the remaining cooking water as necessary. Serve immediately. Note: Curdled eggs will ruin this dish. To prevent this from happening, be sure to whisk constantly when adding the hot ingredients to the egg mixture.